As many of you know for the past couple of months I have been training to row a marathon to raise money for Changing Faces – a UK charity that represents people with disfigurements. Yesterday was the big day. Here you can see me at the start – fire extinguisher behind me in case the speed of my rowing proved combustible (it didn’t). 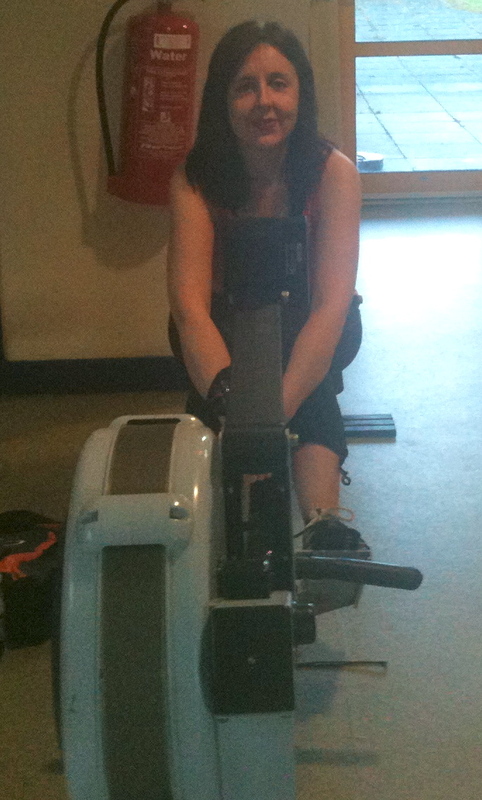 I did the row in the local leisure centre (Penlan). The staff were absolutely fantastic. They put me and the rowing machine in reception so everyone could see me when they came in. And it was amazing. The row itself took rather a long time (in my defence it was 26.2 miles but 5 and a half hours still tells you a lot about my pace – slow!). I played various internal games to get through it. First reach 1000m and celebrate with a song (listening to a song I mean – I would have cleared the leisure centre if I’d started to sing my way through the row); next reach the 10k mark and have an energy bar; next the half marathon milestone and a dash to the toilet etc. – all little treats that keep you going (yes even a toilet break was a treat!). And when even those blocks were too large I’d aim just for next 500 metres or even 50m. Each bit took me closer to my distance- however small or insignificant it was all part of the larger whole. Like everything we do in life really- if only I could remember that. I had my iPod on and at various intervals (usually 1000m) I would switch to a new podcast so that I had something different to listen to. Over the course of the 5 and half hours I listened to Jillian Michaels (she is strangely engaging), Livin La Vida Low Carb (athough I’m fast becoming disillusioned with Jimmy Moore I like the interviews for some reason), fantastic running podcasts (Runner Academy with Matt Johnson was my favourite), a variety of podcasts on Zen Buddhism (when I felt the need for some internal tranquility – i.e. when the stabbing pains in my buttocks started) & life coaching (when I felt the need for inspiration – i.e. when I could no longer uncurl my hand) & now & again some music (Glee – you never fail to motivate). All around me the usual Saturday morning leisure centre activity was going on (in the main bleary eyed parents taking hyperactive children swimming). It was curious being there & seeing it all, but at the same time not being there- in a very different place inside – a place where 50m was a cause for celebration and where 3 hours in I realised exhaustion had taken away my ability to count. But through it all I just rowed, and then rowed some more. People were so generous and kind. They’d encourage their children to come put money in the bucket & the children beamed at the tinkling sound of the coins hitting other coins (as did I!). They’d all smile & say good luck. A few came over and asked how long I’d been going, how long was left etc. The support was truly moving. I once wrote about the Kindness of Strangers in regard to a new guild I had joined- an online in-game kindness that felt so different from what I normally encounter in dungeon groups. Well yesterday I discovered the kindness of strangers in my own local community. It’s something I’m usually oblivious to. In fact I think we all are. We see people but we don’t know them. We walk past each other daily with barely a sideways look. We are all getting on with our own lives. But yesterday showed me that put something a little different in front of people (some crazy woman rowing away in reception for a charity) and people will connect. The barriers are immediately broken down, there are smiles and good wishes. There is hope. We see and hear such awful things in the news everyday – we are in danger of thinking all that is representative of humanity as a whole. But it’s not. Most ordinary people are just getting on with things. Yes they are busy. Yes they are often absorbed in their own lives and concerns. But uncaring and unkind? Absolutely not. Everyone yesterday showed what good hearts there still are in this world. It was truly life affirming. And as for me- well I got through it. It was quiet when I finished – the morning swimming rush was over. Husband was stood behind me watching the final meters as they appeared on the screen. We cheered at the end – the two of us and the leisure centre trainer manning reception. An understated finale to be sure but perfect too. I stood up, winced (everything hurt), said thank you to the leisure centre trainer for everything he & all the staff had done, packed up my things & came home. Husband spoiled me for the rest of the day and we did indulge in a pizza I have to confess- I needed to replenish my carbs after all. Today I feel great. Actually so great I’d love to go up the gym for a run (couldn’t face a row!) but husband won’t let me – he is advising rest until Tuesday – and for once I will listen because I don’t want to get injured. On Tuesday my marathon running training starts. I have proved to myself I can dig in and row for over 5 hours no matter how unhappy my body feels. I have overcome a fear – my marathon fear – and now I’m ready for more. Next week it is Changing Faces “Face your Fears” week. Changes Faces is a fantastic charity- it is changing people’s lives. If you can donate something please do so- the link to my Just Giving page is here or you can donate on the site itself. But also consider taking part yourself in Face your Fears next week. People with disfigurements very often have to face challenging social situations. And very often they have no choice- not if they want to live their lives. And so they do it – daily – no matter how hard. Next week is a chance for all of us to think about the fears we have, whether we are letting them hold us back and if so what that means for the quality of the life we live. And then we’ll be left with one question – do we want it to change? And if the answer is yes it’s time to deal with that fear. Yesterday showed me that there will be plenty of people around to help you do this – people who you might not even know. And once you realise that then there is no fear. Bravetank finally reentered the dungeon world today after quite some time away. I decided to go into my old favourite Dire Maul – Gordok Common. I’ve been in there so many times some of the mobs no longer attack me and instead give me a little wave. I have after all been crowned their king over a hundred times. So it’s nice there. I take treats for the dogs.